BRC-001-BH | Technician's Briefcase Work Box With Black Hardware - $55.00 !!! 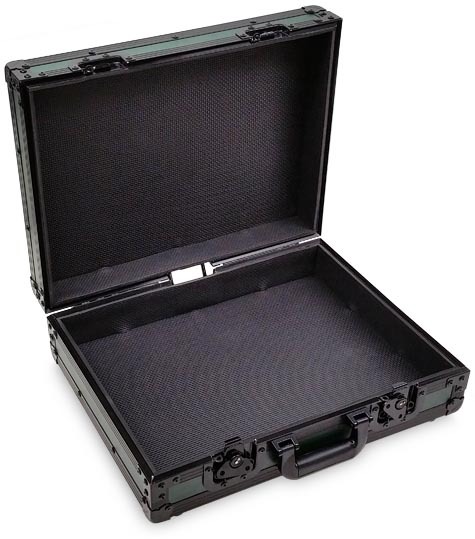 Home > Cases and Hardware > Road Racks and Cases > Briefcase Style Workboxes > BRC-001-BH | Technician's Briefcase Work Box With Black Hardware - $55.00 !!! This is the EWI Tourcase tm BRC-001-BH Briefcase, this is a version of our popular BRC-001 briefcase with all black extrusion and hardware. Currently the EWI BRC-001-BH briefcase is available in 8 colors. 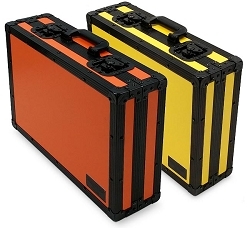 This case is well suited for the technician who needs something suitable to hold a small mixer, specialized equipment, tools, audio cables, and other items, and to pack that stuff to the job site in style. There's nothing like an ATA style briefcase to accompany a sound or lighting technician's entrance on a job site. The BRC-001-BH side panels are constructed with 3/8 inch hardwood plywood and covered with an ABS laminate finish, the camo briefcase is a cloth laminate. The extrusion is all aluminum and the case is assembled with aluminum rivets. 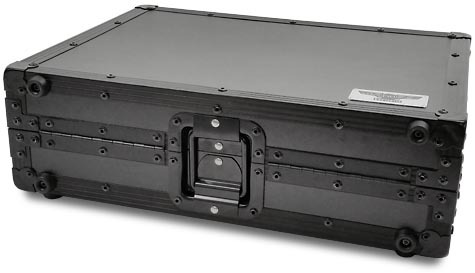 Mounted on the bottom of the case are 8 solid rubberized feet for laying and standing positions. The case is equipped with two recessed butterfly latches on the front which securely latch the case together and which have previsions for small pad locks. The case lid is hinged on the back with a robust piano hinge and lid stop. The carrying handle is nicely padded, and won't bite into your hand even when the case is heavily loaded with stuff. 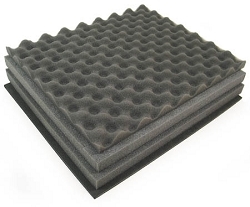 The inside is fully padded with 1/4" thick high density foam. There is also available an optional "dice cut" Pick & Pluck foam insert which allows the creation of custom pockets to hold test equipment and such. If you are using the pick and pluck foam for microphones or other low profile items, 2 sets of pick and pluck foam per briefcase work best. Otherwise, there is empty space inside the lid and the items are more likely to move out of position when the case is carried upright by the handle. Depth of tray: 2 1/2"
Height of lid interior: 2 1/8"
Over-all interior height: 4 5/8"
Dimensional shipping weight: 18 lbs. Warranty: 3 year covering mfg. defects.